IdleMaster® Tensioners — designed to make your roller chains last longer, and built to outlast many other types of tensioners. Ideal for high pressure point areas. Interchangeable with #50, #60, and #80 pitch roller chain. Perform smoothly on both worn and new chain. Bushings accommodate 3 bolt sizes. Superior replacement for all types of equipment. IdleMaster® Tensioners for Roller Chains – Complete Interchangeability. 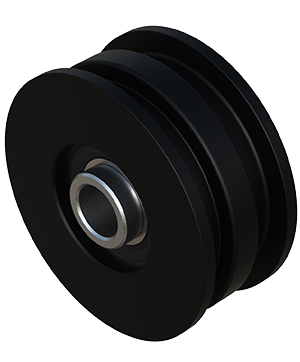 The design of these all-new idlers from Black Ace® allows a wide range of applications, including the tightest spots…extending the life of your roller chains. Interchangeable with most idler sprockets. Precision machined of heavy-duty steel to last much longer! Can be stacked for doublechain applications. Bushing accommodates 3 bolt hole sizes.